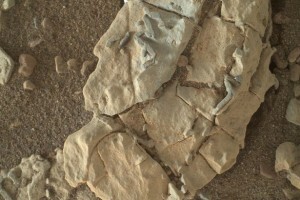 NASA has covered up evidence of alien fossils that show “soft-bodied creatures” may have once roamed the surface of Mars, a top scientist has claimed. Dr Barry DiGregorio believes images obtained by the space agency’s Curiosity rover in early 2018 show that aliens once existed on Mars. The Curiosity rover is currently exploring the surface of Mars. However, according to NASA, the shapes captured in images from the Martian surface are nothing but rock crystals that are currently undergoing analysis. Dr DiGregorio believes the space agency is orchestrating a cover-up. “Put it this way, these images, these figures, have not been seen on Mars to date,” he told the Daily Star. “One of the things that grabbed me immediately was the expediency that NASA left the area of such a mission. So when I started looking, it wasn’t just the objects that were attached the outside, what they are calling sticks. “If you look at the images more closely, the sticks merge into the host rock, this actually has features in it that are reminiscent of trace fossils. “Crystals don’t add up. Crystals don’t branch or twist. We’re talking about something that might have been equivalent to the Ordovician period on Earth. The former research fellow at the University of Buckingham has said he plans to team up with two other experts to go over the findings from the Curiosity rover. He plans to publish a full report that proves the crystals are in fact trace fossils of an alien race. According to Dr DiGregorio, Mars hosted life in a giant lake on its surface around a billion years ago. “If you have been in this as long as I have, to have seen all the things I have seen, with NASA, I would actually say that they are avoiding looking for life,” he said. NASA is in the process of preparing a manned mission to Mars that will happen in the 2030s.